Recently, I had the opportunity to visit the start-up operations for what is commonly referred to as Phase II of the Boston Harbor deepening project. And, while Jay Cashman, Inc.’s Cashman Dredging and Marine Contracting Company (Cashman Dredging) and the Dutra Group joint venture are off to an auspicious start to this important infrastructure improvement, I was particularly impressed with the new technology that Cashman Dredging has designed and implemented to prevent inadvertent placement of dredge material in non-authorized ocean disposal sites. This innovative technology, aptly named the Scow Geofence System (SGS), was developed right here in the United States by the Cashman Dredging team of Norman Bourque, Frank Belesimo and Tim Manning. Cashman Dredging also presented its SGS concept during proceedings of the Western Dredging Association’s Dredging Summit & Expo in June 2018. It would not be overstating the matter to say that SGS will likely become a dredging industry standard. And, for good reason. Human Error is just one of them. Accidental discharge of dredge material outside of approved disposal sites is actually a big problem. Over the past decade, human error has significantly contributed to the accidental discharge of dredge material from split-hull dump scow barges. The dumping operation of a scow requires a crewmember to activate a switch that in turn allows the scow to “split open” and dump its dredge material. The accidental dumping of dredge material is usually a result of poor communication between crewmembers. In these instances, dredge material is dumped outside of the authorized disposal sites in violation of the Marine Protection, Research and Sanctuaries Act. Consequently, the Environmental Protection Agency issues fines against the dredge operators who discharge their scows outside of the approved disposal sites. SGS has the potential to completely eliminate that possibility. Compliance with the Marine Protection, Research and Sanctuaries Act (MPRSA), commonly referred to as the Ocean Dumping Act, isn’t optional. It became law in 1972. Under the Act, the U.S. Army Corps of Engineers issues permits for the disposal of dredged material subject to EPA’s concurrence. The Environmental Protection Agency (EPA) administers and enforces compliance with the MPRSA. The EPA designates dredged material disposal sites for long-term use. Before designating these sites, EPA conducts an extensive environmental review process, including opportunities for public participation. Each designated site has its own site management and monitoring plan. Disposal of dredge material is strictly prohibited outside EPA designated sites because of the potential for harm to the marine environment. Cashman Dredging set out to find a solution to the human error problem of accidentally discharging dump scows outside of the designated dump sites. What they came up with is the Scow Geofence System (SGS). The system itself is comprised of a small computer and a Global Positioning System (GPS) receiver that is connected to the scow controls. SGS utilizes a relay that connects it to the scows programmable logic controller (PLC). The PLC controls the communication, engine start and stop and the sequencing of the hydraulics for the split hull scow. In a nutshell, the SGS does not allow a scow to dump its dredge material unless the barge is inside a predetermined geographic zone, or so-called “geo-fenced” area. Even if a crewmember activates the scow’s dump switch, the barge will not split open if the vessel is not within the geographically fenced area. The vessel must travel into the geo-fenced area for the dredge material to be discharged. More to the point, SGS locks the PLC control of the scow-opening process within seconds of the GPS antenna transiting outside the predetermined geofence ocean dump site. Testing and real-time operation of the Scow Geofence System indicates that SGS has the potential to significantly reduce the human error element of accidental split hull discharges. Since Cashman Dredging implemented SGS in 2016, the company has tracked and recorded over 550 disposal events. Notably, there have been no accidental discharges of dredge material since implementation. This is all good for the operator, regulator and the environment. It’s quite likely that geofencing for dump scows will become an industry standard. 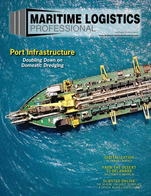 With the number of dredging and infrastructure projects now underway in North America, that development can’t happen soon enough.